Not only is it the first Wednesday of the month, but it's the first Wednesday of the new year! 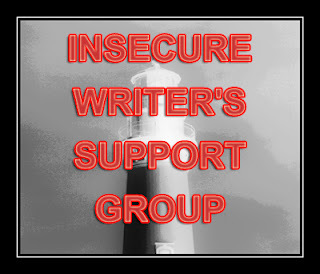 That, of course, means it's time for another post from the Insecure Writer's support group. This month I want to talk goals. (I bet you weren't expecting that!) Last year I made a few goals and I set myself some deadlines. I didn't reach a single one of those milestones, but I'm still glad I set those goals. Even if I fell short, I still had those objectives in mind, and they pushed me to do more with my writing than I ever have in years past. I'm always insecure about what I can really accomplish, so I'm going to lay out my goals for IWSG in hopes that I can gain strength from this support group to actually attain my dreams of publication. 1. Finish writing my current unnamed YA romance novel. 2. Polish Stealing the Stars, My NaNo novel. 3. Give my first oral pitch at a writers conference. 4. Polish said YA romance novel. That alone should fill up 2013 writing wise (and I want to squeeze another book in there too if I can). Hopefully, I'll be able to accomplish all of it. But if not, I'll be happy if I accomplish at least two of these goals. Here's to an awesome 2013! Good luck with your goals! Happy New Year, Jennie! Those are some fantastic goals! And you're right, even if we don't reach all our goals, it's still good to set them, to give ourselves some direction and some impetus to move forward. For me, at least, it's too easy to fritter and dither my time away otherwise! That's a nice list. Good luck in reaching them, and if you don't, it's not a big deal. Life changes constantly, so goals have to be flexible too. Great list-- good for you for stepping out in action! The last one surprised me - that is really cool. Yes, to a good 2013! I'm sure you can make all of those goals, even if they are big. Good luck! Great goals! And I love your title, by the way! I'd totally pick up a book called Steaing the Stars! Good goals! Giving a pitch isn't as scary as I thought it would be - you will be awesome. Keep plugging along - 2013 will be great! The thought of an oral pitch terrifies me! Best of luck with everything in 2013! Wow, I am impressed at those goals! And oral pitches are fun. Unless they scream at you and humiliate you in public. Except for that! Sounds like you've got a busy year ahead - good luck with it all! Ooo . . . good luck with the pitch. I've never done one. The thought scares me to death! Best of luck with all your writing goals! It seems like you have a good plan! Good luck with all of them! The oral pitch would be the scariest for me. I sound like such an idiot when I try to describe my stories to people. And I'm a reading teacher - I pitch books to my students all the time. You'd think that might translate into talking about my own work comfortably. Let me know how that one goes! Great goals and very reasonable. I think you will find yourself meeting and surpassing them this year. Maybe even making new goals:) good luck this year! Now I'm off to make my own New Year's Goals list! I LOVE your anthology goal. Sweet. This all sounds totally do-able. Practice that pitch and remember it will be a conversation with you and the agent, not you giving a speech while the agent is your sole audience. Seriously. This tip saved me and I luckily got it from an agent panel right before I went to pitch a couple of them. I tossed my notecards and went for it, but it would've been nice to be prepared for that. Those are all great goals. I would definitely be scared of #3! Good luck with them all, I'm sure you can do it. Wow! That's a great group of goals! Best of wishes for life and writing in 2013! awesome goals and i bet you cross most of them off. we cant cross all our goals off, then wed just have to make more! Having them in place will keep you moving forward. It's all about the journey. Love your NaNo title, and Christmas anthology sounds so fun. I've thought of doing one myself. Good luck in 2013! I remember my first conference pitch. Don't worry, you'll do great. Sounds like you're going to have a productive 2013. Good luck with all of these goals! My writing plans for 2012 were unfinished as well. But like you I hold no regrets. I have made set goals for this year though and plan to accomplish them all. Best of luck accomplishing your goals this year.